This is the replacement controller that is included with our Advanced Moonlight System. It runs 3 arrays of LEDs with 12V forward voltage arrays. Maximum of 1A per channel. Comes complete with a 24 button wireless remote control (16 selectable colors, 8 different intensities). It also has it's own power supply so that you can put it on a separate wall timer (yes this controller has memory, it turns back on with the same setting that it was turned off with). 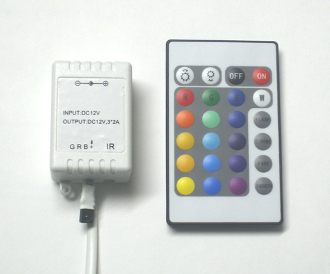 Length of LED strip - No LEDs included, this is the controller, remote, and power plug only. Energy consumption - extremely low, about 12W. 1 - 1 amp 12V power supply, enough for 16 feet of moonlighting! Disclaimer: These units are relatively expensive units being sold at a low price, and we are selling these as a service to our customers. Please be understanding that there will be no warranty for these items as we do not make enough profit to cover a warranty. Like all of our items, they are warranted against complete and total DOA. Up to 3 single LEDs not functioning within the strip is an uncommon occurance, however this is not covered against DOA. (Colors on the remote may be reversed, ie the red button may change the light to blue, this is not covered by the DOA warranty) Thank you for being understanding about receiving this outstanding moonlighting system at an amazingly low price, which helps us keep our prices ultra low. Don't confuse this with the cheap knock-offs sold by Amazon, those are flimsy and unreliable. This is the real deal. Installation time - 60 seconds! Absolutely no heatsink required, you can even mount it suspended in the air!